Google Drive gets an AI upgrade. Google is using artificial intelligence to make it easier for you to find the files you need inside Google Drive. Its next update will add an interface that predicts the people and files you’re most likely to want and makes them more visible, speeding up your workflow. Almost all of Google’s products are being improved by artificial intelligence in some way. It does everything from suggesting replies to your emails and editing your photos, to finding products based on images and sorting all your photos. Now AI is coming to Google Drive to make finding files simpler. 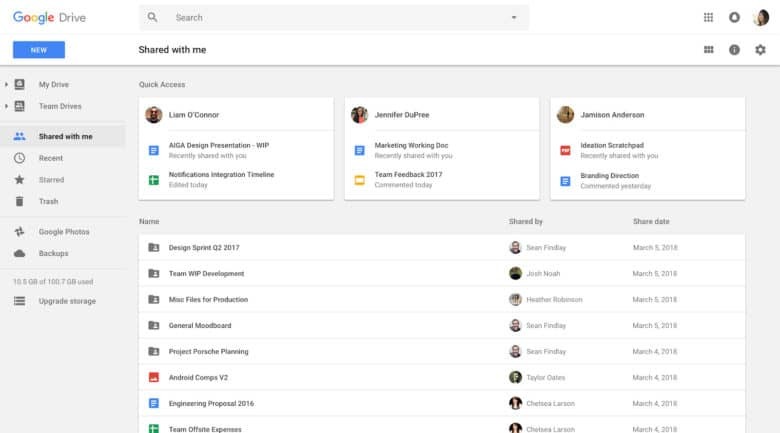 Inside Drive’s “Shared with Me” section, where you’ll find all the files that you’re collaborating on with others, Google will start intelligently organizing everything. Under “Quick access,” you’ll see common contacts and all the files they’ve shared with you. The more you use the new system, the better it will be at predicting what you need, Google says. It is also working over the next few months to make collaborating more efficient. Google has used artificial intelligence and machine learning for some incredible things, like beating the world’s best at a game of Go. But this Drive update is yet another example of how Google is using AI to effectively make our lives that little bit easier. It’s easy to see how similar intelligent predictions could be useful elsewhere. In Google Calendar, for instance, AI could one day help you manage your schedule and remind you when certain appointments — like a visit to the dentist or an annual meeting — need to be set. In your contacts app, AI could suggest people you might wish to speak to based on other things you’ve been doing that day. Google may even have the power to determine what those contacts are doing — based on their calendars and other things — and recommend a good time to call. If you aren’t excited by what the future of AI and ML might bring, you should be.